It's Tuesday morning, and instead of snowboarding, we are sitting in the condo waiting for the sun to burn off the thick layer of clouds. The webcams from this morning showed very foggy slopes, but this aftenoon looks promising. We are saving our full-day passes for tomorrow, but the boys and I are doing the half-day today. Things aren't too busy around the village, but they are not dead either. Esther can do some shopping this afternoon while we are on the slopes. 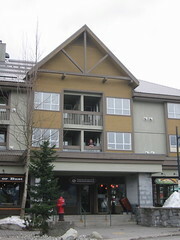 The condo is fairly convenient as it is on the edge of the village proper. There is a large grocery store right below us, and we can leave our van in the underground parking.